Sugar Swings! 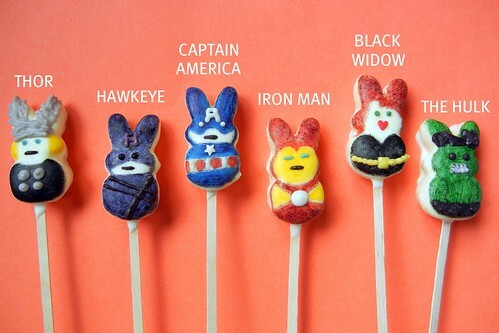 Serve Some: The Avengers (Day 4 of Peep Pop Week)....! The Avengers (Day 4 of Peep Pop Week)....! ...so is anyone sick of peeps yet?? almost through the week so hang on! ....in celebration of all those peeps on the shelves this time of year.....i've decided it's Peep Pop Week!.....7 days of nothing but peep pops with a different theme every day here.....!!! 7 DAYS OF PEEP POPS!!! 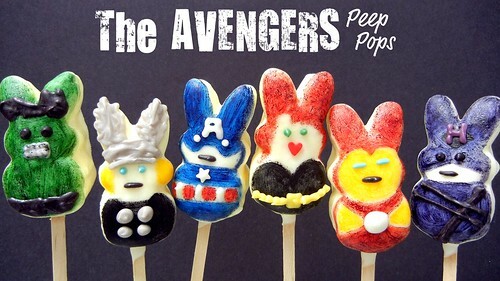 DAY 4 is The Avengers Peep Pops.....!!!!! ...thanks for swinging by and don't forget to stop by tomorrow for Day 5! Thank you for the smiles, these are so cute and fun. You really need to send these posts to the Peeps people:) Great job on Yhe Avengers! well I'm sure the peep people are being inundated with peep stuff right about now! These are so great! Can't wait to see what you come up with for tomorrow. Great job! glad you like them Daniele! These adorable guys are being featured today at Mrs Foxs Sweet Party! Thanks for linking up! blue moon beer blondies & cupcakes....!